My kids love this slice so much, I've had to inform their girlfriends over the years that my sons can't get married until their prospective brides-to-be learn how to cook this one. (Well, this is just the beginning of the repertoire). Beat butter and 1/2 cup sugar to a cream. Butter a flat square cake tine, put mixture in, work out flat with fingers. Spread thinly with a layer of jam. 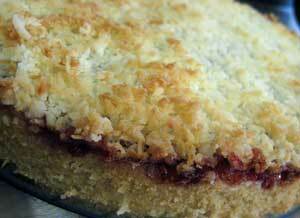 In a bowl, beat 1 egg, cup of sugar, cup of coconut and spread on top of the jam layer with a fork. Bake for 15 minutes in a moderate oven. While still warm, cut into squares and place into airtight container. Good for a week.